Donna’s Tamales makes the rounds in the San Francisco Bay Area. This authentic, handmade Mexican food pop-up appears at the Farmers’ Market in the San Francisco Ferry Building on Tuesdays, San Rafael Farmers’ Market on Thursdays and Sundays, Oakland’s Grand Lake Market on Saturdays, and Oakland’s Temescal market on Sundays. Everything they serve is vegetarian or vegan, and the dairy-free offerings include several types of tamales (savory and sweet selections! ), Enchamales, and various Burritos (including eggplant burritos!). 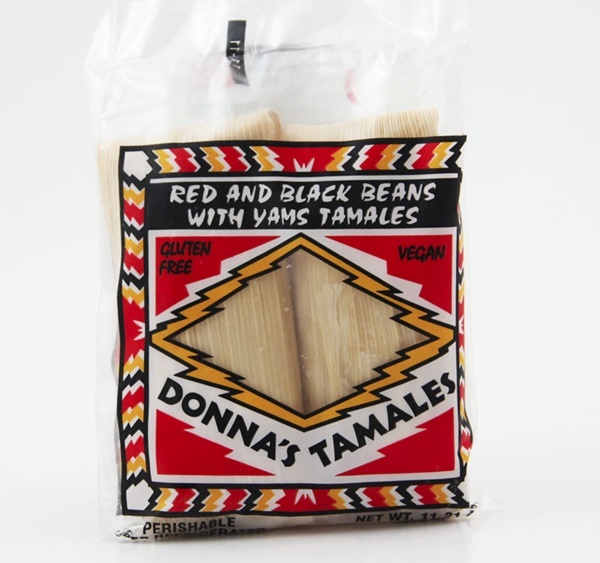 Select Donna’s Tamales are also sold in local grocery stores, but you will find a much bigger selection of vegan goodies (fresh!) if you seek them out at one of the markets. See the Donna’s Tamale’s website (below) for more information.